Happy final weekend of 2017! Does anyone else feel like this year passed with a blink of an eye? Although I'm sad the holidays are coming to an end, I am excited for the new year and a fresh start. I've had so many wonderful opportunities come my way this year, and I can't wait to see where they take me in 2018. I'll be taking time this weekend to reflect on Threads for Thomas, and plan my goals for the blog this upcoming year. What you can definitely expect in this new year is seeing more of my everyday style, along with videos! I recently started doing live videos in my FB beauty group, and it's given me the motivation to film videos and improve (or I should say restart) my YouTube channel. Of course, your opinions mean everything to me, as they are what drive my motivation for this blog, so I would love to hear what you would like to see more of on Threads for Thomas. Mom style, trends, family/lifestyle, beauty? Please let me know in the comments below. With the year coming to an end, also means finding the perfect New Years Eve look! 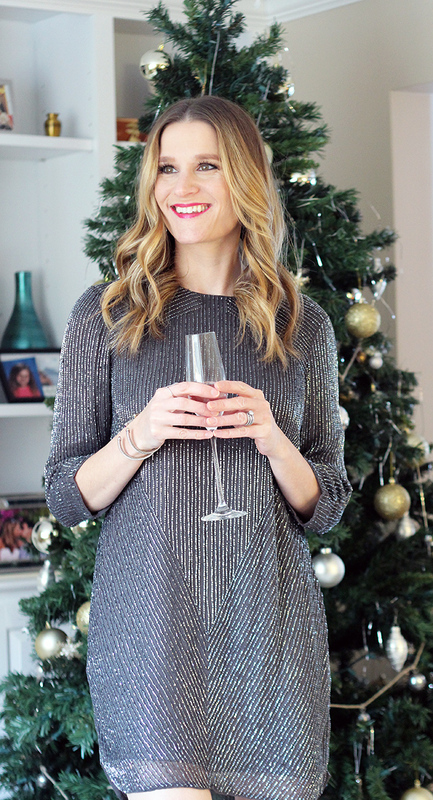 If you're anything like me, then you know that having some kind of sequins/sparkle in your outfit is a must, even if you're hanging on the couch! 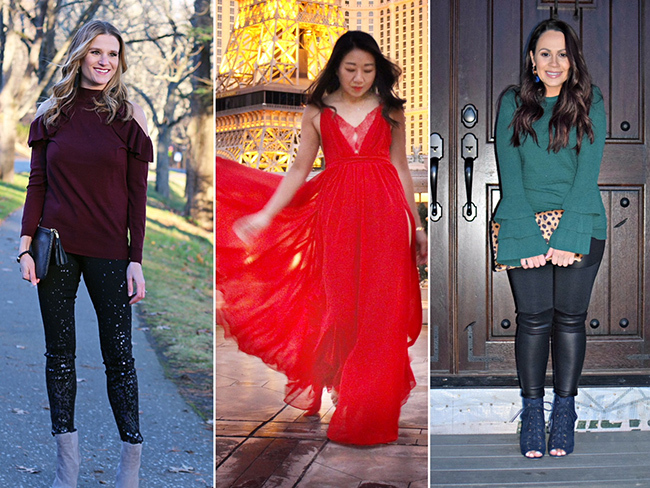 Whether you're looking for an amazing dress, a cute top, or a fun pair of slippers, I've rounded up the perfect items that you'll want to wear while ringing in the new year. This Parker Petra dress is by far one of my favorite NYE purchases. I bought it three years ago, and it has become a staple in my closet for special occasions. Not only do I love the beading and slight sparkle, but the shift style is perfect for all the appetizers I'll be over indulging on this Sunday night. Not to mention that the long sleeves are ideal for this freezing weather that we are experiencing here in New England (hence the indoor photos)! Because it's been so cold, I chose to pair this dress with booties, and love the slight mod feel that these blue velvet ones added to the dress. For a dressier look, I would pair it with heeled sandals or a great pair of pumps. If you're looking for a fun NYE dress, then I highly suggest checking out Parker. The brand is my go-to when it comes to dresses, especially ones that are sequined or beaded. They are always well made, and most of the styles are classic, so you'll be wearing them for years to come. Parker is currently offering 30% off site wide with the code RINGIN2018, so it's the perfect time to add that perfect dress to your wardrobe, even if it's for a future occasion! I wish everyone a very, very happy 2018, and lets cheers to the best year yet! The feature blogger is Katherine of One Swainky Couple. I love the detailing on her dress, which also makes the perfect NYE option. 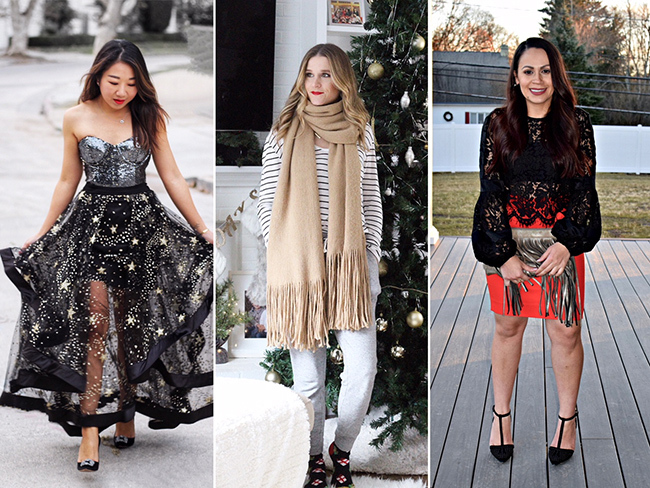 Make sure to check out her blog for more NYE looks, to get some style inspiration for those men in your life, and to say hello! Happy Friday! Can you believe that Christmas is just three days away? I'm extra excited this year because the twins are old enough to (somewhat) understand the holiday, and I can't wait to see their reactions on Christmas morning. I'm going to keep today's post short and simple, as I have so much wrapping to get done! 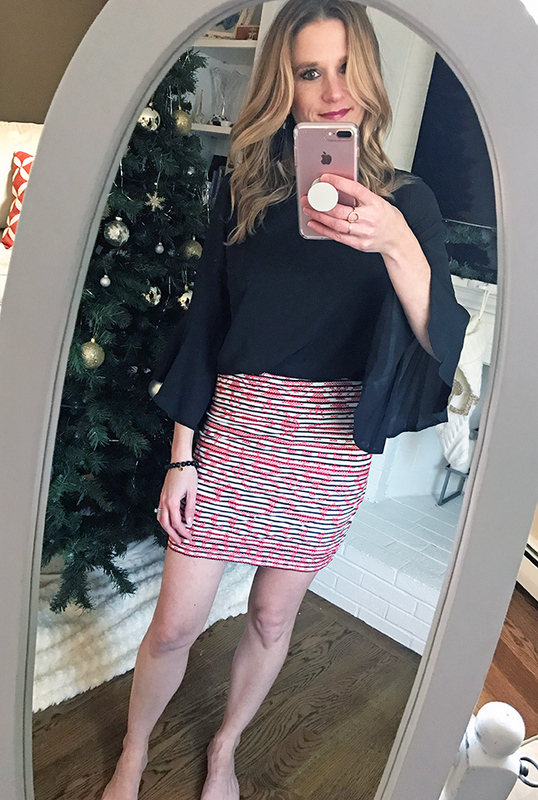 This blouse is from the Who What Wear for Target collection, and when I bought it last month, I thought it would be perfect for the holidays (it also comes in a floral print). Instead of reaching for a skirt, or my go-to black jeans to dress it up, I thought it would be fun to pair it with white, and love the way it looked. I'm a big fan of wearing white year round, and love how they give off a dressier feel than your classic blue jeans. 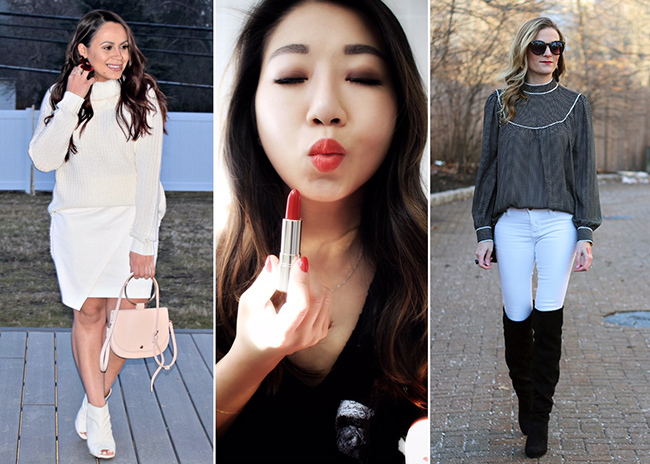 I finished my look with over-the-knee boots, which added a winter touch to my white jeans, then went for a little pop of color with a red lip. Happy holidays, and wishing everyone who celebrates a very Merry Christmas. The feature blogger is Natalie of Kindof Voguish. Not only am I in love with her sweater, but she had the best maternity style. Make sure to stop by her blog and say hello! Between the first snow and freezing temperatures here in New England, the only thing that I've been wanting to do is snuggle on the couch in my favorite sweatpants, under a cozy blanket. In fact, that's exactly what I've been doing most of this week since my kids and I have all been sick. I can't tell you how happy I am that I found these Lou and Grey sweatpants, as I've been living in them. Seriously, I've worn them four days this week, which I probably shouldn't be admitting.... Not only is the jogger style super cute, by they are SO comfortable, and they wash well, which is a plus for this momma! Speaking of comfort, if you're still looking for the perfect holiday gifts, I highly suggest ones that provide coziness and warmth. 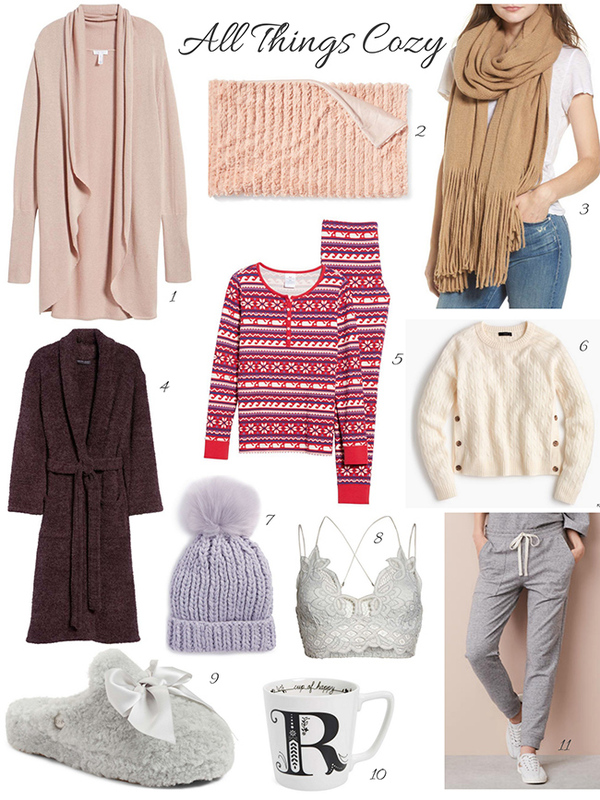 That's why I'm giving you a gift guide of all things cozy, rounding up my top picks that will make you, or someone special, want to snuggle all day long. I bought this cardigan this past summer, and literally live in it. Not only does it look great over everything, but it is super soft, and comes in ten colors! In fact, I think it's time to add another one to my wardrobe! I bought this throw in the ivory color during Black Friday, and it's been my favorite purchase yet this season. Not only is it super soft, but I love the subtle faux fur, making it the perfect blanket to drape over your furniture for added texture. It's available in three colors. You may have noticed this scarf floating around Instagram, as it is the IT scarf of the season. When I finally purchased it for myself, I realized why. It's SO soft! I want to wrap myself up in it everyday. Plus, the oversized fit and fringe hem make it the perfect finishing touch to any outfit. It's under $50 and comes in several colors. Is there anything cozier to wear around the house than a bathrobe? I love how a high quality bathrobe can give a luxurious feeling, and this one from Barefoot Dreams does just that. It's seriously a dream! Pajama sets are my favorite to wear around the holidays, or when I'm traveling. This one is just so festive and cute! I'm also loving this set here. I live in sweaters in the wintertime, and this cable knit one is not only classic, but the buttons add a fun and unexpected detail. It will go with everything, making it a great gift! Beanies add the perfect finishing touch to any cozy look, plus keep you extra warm. I love the oversized pom pom on this one! Not only are (most) bralettes more comfortable than bras, but they look cute under tee shirts and big sweaters, adding the perfect layering piece to those cozy looks. In my opinion, UGG makes the best slippers. You can never go wrong with the classic Dakota style, but these plush ones are on the top of my list. Not only are they cozy, but the bow adds a cute, feminine look. When I think of being cozy, the image drinking hot coco in front of the fireplace always comes to mind. Mugs are always on my gift giving list, as I believe, one can never have too many. I also love giving ones with initials or that are monogrammed, as they add a personal touch. As I mentioned above, I'm obsessed with these sweatpants! Hurry, they're currently 50% off and ship free! The feature blogger is Laura of I Do deClaire. I'm loving her red dress! The ruffle shoulder is so fun, and the best part is the price! Make sure to stop by Laura's blog for her outfit details, and to say hello. Earlier this week I received my latest Stitch Fix shipment, and I have to say, it was one of the best yet! Those who have been following this blog for the past year, or longer, know that I've been really happy with my Fixes. My stylist usually gets my style spot on, which is why I went from receiving monthly Fixes, to every other month, because they were draining my wallet! Now, they haven't all been perfect, but loving eight out of the past ten shipments is a pretty good number in my book. This month's Fix was filled with pieces that were ideal for the holiday season and beyond. The item that first caught my eye, which I needed to try on right away, were these Level 99 iridescent splatter jeans. Not only did they fit perfectly, but I love how the grey paint splatters shimmered in the right lighting, making them perfect for any holiday event. It totally looked like I was wearing sequin pants in these photos, but if you look closely, you can see that they're shinny splatters of paint! The other item that caught my eye was this cold shoulder sweater. You all know that I'm a sucker for anything cold shoulder, so that mixed with the ruffle detailing had me excited to try it on. 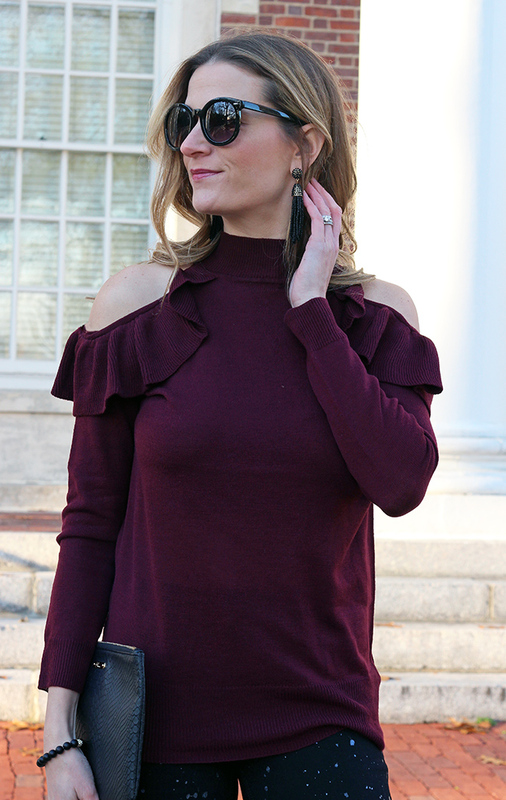 The fit was spot on, but I was a little hesitant to keep this one, as I had just added this cold shoulder sweater to my wardrobe. However, since I didn't yet own a burgundy sweater, and the cut was slightly different, I decided to keep this one too! 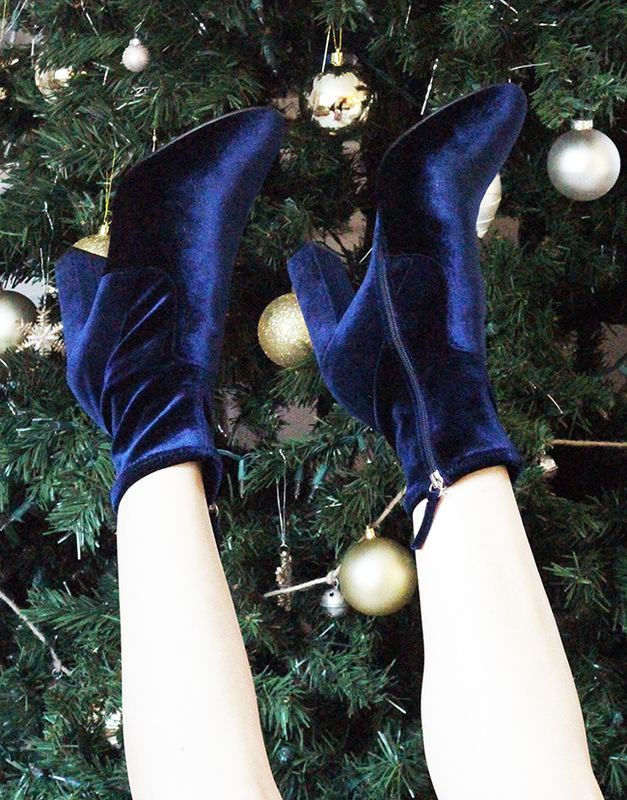 Together they make a perfect holiday outfit. I finished my look with my favorite grey booties (now under $100), and love the edge that they added with the splatter pants. To make this look a bit dresser, I would switch out my boots for a pair of killer heels, and add more sparkle with my jewelry. Also included in my Fix was a cute fitted skirt, a bell sleeve blouse (which I also loved) and a pair of fringe earrings (items shown at end of post). Because I only allow myself to keep a item or two each Fix, these were sent back. I have been using Stitch Fix for a year and a half now, and love the service. As someone who is a constant shopper (aka shopaholic), I love that I get a package full of clothing delivered to my doorstep every other month (you can get it as often, or little as you would like), with no obligation to buy! Even though I consider myself to be a stylist, it's always fun to have someone else's eye, because they introduce you to things you would never think of trying on yourself. Not only is my favorite sweater from Stitch Fix (remember this one here), but I have discovered several new brands that I love through the service. If you're looking for the perfect gift for that special woman in your life (mom, sister, best friend), then I highly suggest a Stitch Fix Gift Card! They come in any denomination over $20, and are perfect for those of you who are last minute shoppers, because you can print the gift cards from home! Not only are you giving the gift of style, along with your own personal shopper, but it's also a gift of convenience. Perfect for those busy women in your life who don't have time (or like) to shop. And ladies, don't forget that Stitch Fix has men's! Give those men in your life a little style! If you're unfamiliar with Stitch Fix , make sure to read this post here, and check out my last review here. The feature blogger is Sarah of Sew Sarah R. Not only am I in love with her sweater dress, but how perfect are her red booties for the holidays?! Make sure to visit Sarah's blog and say hello!